Iskander Smit is the Innovation Director at Info.nl, an Amsterdam agency which designs connected digital products and services. He is responsible for the research and development and he manages labs.info.nl. Iskander has a background in Industrial Design Engineering and has been working as a creative and strategist in digital services. He has a proven track record for designing and thinking on the Internet of Things. As of 2009 Iskander is a member of the Internet of Things Council and in 2013 he co-founded the Bahavior Design AMS meetup. 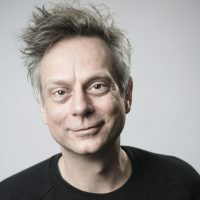 In December 2014 he initiated and co-organized the (now annual) Amsterdam edition of the Berlin conference Thingscon, a leading conference on the design of the Internet of Things that aims to foster the creation of a responsible and human-centric Internet of Things. In April 2017 Iskander started working as a visiting professor at the Connected Everyday Lab at the TU Delft University of Industrial Design Engineering. Here he will be setting up a new research program that will study the impact of things as citizens in our intelligent cities.